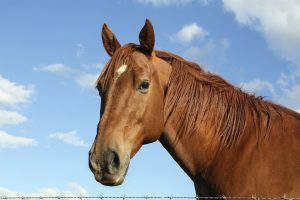 If you are a horse owner, your investment is worth protecting. Having a disaster readiness plan for horses in place will help protect your horse from natural disasters and everyday accidents. Here are 10 tips for safety and disaster prevention around the barn. Keep it Clean Keep a clean and tidy stable and pasture. Remove hazardous and flammable materials, debris and machinery from around the barn’s walkways, entrances and exits. Inspect your grounds regularly and remove anything that could be hazardous to your animals or others. Ground Stability Check your barn floors and septic tanks. Many accidents occur when horses fall through old floors and old septic tanks in the ground. No Smoking Prevent fires by instituting a no-smoking policy around your barn at all times. Electrical Equipment and Wiring Avoid using or leaving on anything electrical unless someone is present. Plastic buckets with built-in heaters and laundry dryers are responsible for many barn fires. Even seemingly harmless appliances like box fans, heaters and power tools can overheat. Regularly inspecting wiring, which can lead to electrical fires in the barn. Exit Plan Your horse needs to be used to wearing a halter. If you don’t ride regularly, halter your horse and do a fire drill on a regular basis so that you will be able to get your horse out quickly in the event of a fire. Horse Trailers If you own a trailer, inspect it regularly for ordinary wear and tear. Also, make sure your towing vehicle is appropriate for the size and weight of the trailer and horse. Many accidents happen because vehicles are not able to handle the size and weight of the trailer. Check your trailer hitch and emergency brake battery as well as tire pressure in order to avoid accidents! Socializing Your Horse Get your horse well-socialized and used to being handled by others. If firemen should come out you want your horse to be easily handled by someone other than yourself if necessary. Make Friends with Firemen Get to know your emergency responders and show them the farm’s layout so they’re familiar with your horses and the hazards and scope of the property. Buddy System Set up a buddy system with other nearby horse owners and local farms. This is important in case you need to evacuate animals or share resources like trailers, pastures or just some extra help. File Important Papers Keep equine veterinary records in a safe place where they can quickly be reached. Be sure to post emergency phone numbers by the phone. Include your 24-hour veterinarian, emergency services and friends. You should also keep a copy for emergency services personnel in the barn that includes phone numbers for you, your emergency contact, your 24-hour veterinarian and other important contacts. This entry was posted on Tuesday, September 20th, 2016 at 9:02 pm	and is filed under Horse, News & Updates. You can follow any responses to this entry through the RSS 2.0 feed. Both comments and pings are currently closed.